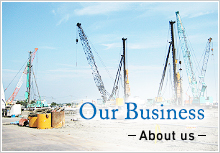 The company was established as a preparatory company before the procedure of shift to a holding company system. On October 1st, 2015, through a company split the preparatory company changed the corporate name to JAPAN PILE CORPORATION and succeeded pile foundation business in Japan from the former JAPAN PILE CORPORATION and restarted. At the same time, the former JAPAN PILE CORPORATION changed the corporate name to ASIA PILE HOLDINGS CORPORATION and shifted to a holding company. JAPAN PILE KISO KOGYO CO., LTD.
JAPAN PILE FUJI CONCRETE CO., LTD.